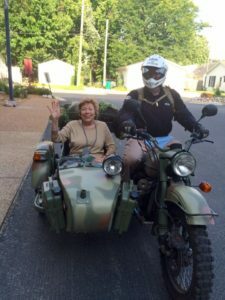 Every year, Snoopy and his motorcycle group come to Hickory Glen to give our residents a ride in their BMW Motorcycle Sidecars. 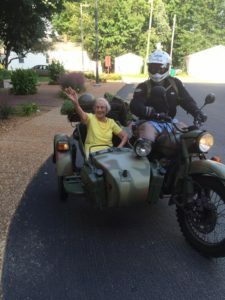 This year, we were fortunate enough to have Hellar Armbruster bring his BMW bike and sidecar to Hickory Glen where over 15 residents were given the chance to take the ride of a lifetime! Hellar Armbruster is a part of the Springfield Milers, which is local bike club that formed in 1981. 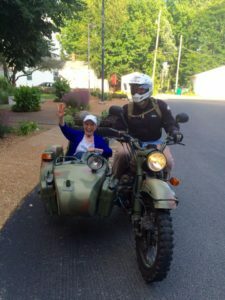 They have on average between 70 and 80 members who meet once a month. During the summer months (April-October) they try to have their meeting out of town so they can all ride together.